This article is sponsored content brought to you by EthOss. By Dr PJM Fairbairn BDS and Dr M Leventis DDS MSc Phd. Only the host can regenerate bone, so we need to work with the patient’s physiologic response for an improved long-term outcome. After tooth removal, especially in the aesthetic zone, tissue profile may be severely affected due to bone modelling when using a traditional delayed approach. 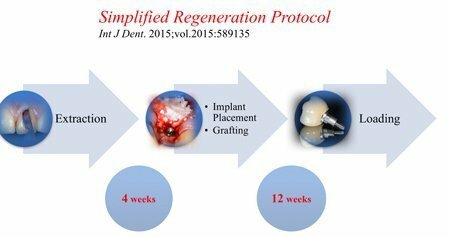 To combat this we need to preserve the residual bone by placing the implant earlier as described by Schrop in 2003. Doing this with immediate placement (also with Socket Shield techniques) can be the ideal method but may lead to complications. Hence the authors have worked with a delayed immediate protocol for the past 16 years which was published on Pubmed in 2015. This protocol involves a 3-4 week healing period, then a small site-specific flap being raised and the site effectively cleaned. The implant is then placed and the site grafted with EthOss, a new synthetic (Alloplast) particulate graft material composed of BTcP and calcium sulphate, which stabilises the graft and has a barrier function removing the need for a separate collagen membrane. The Case is then loaded at 10-12 weeks (Fig. 1). The patient is a 54-year-old male non-smoker who required the removal of the upper left central after a root fracture. 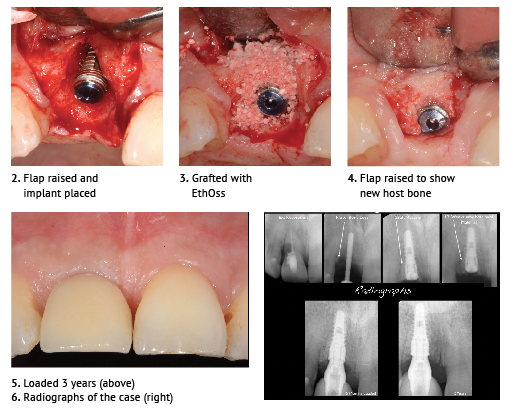 After a 4-week healing period, a site specific flap was raised (retaining the adjacent papillae), the site well cleaned and the implant placed (Dio 4.5 by 12 mm) (Fig. 2) showing the buccal defect. The defect was then grafted with the EthOss as per the manufacturer’s instructions and allowed to “set” by compressing a sterile gauze over the graft for 3-5 mins (Fig. 3). The site was then sutured closed with monofilament sutures (Prolene) without the use of a traditional membrane. After 11 weeks, another small flap was raised to show the new host bone regenerated site (Fig. 4). Histologic studies (see Pubmed) have shown that over 50% new host bone is seen at 10 weeks when grafting with EthOss. The case has now been loaded for 3 years (Fig. 5) with no loss of tissue profile in line with Wolff’s Law. The functional loading and retention of bone can be seen in the case radiographs (Fig. 6). A stable, biocompatible material, EthOss up-regulates host healing of the hard tissues (and therefore also the soft tissues) with reduced surgery and hence reduced patient morbidity.